His code name was Seagull. He was a highly placed foreign diplomat. He could be a valuable asset if he became a spy for the United States. The problem was, how do you convince somebody to pledge their allegiance to an opposing country? The answer was to befriend Seagull and make him an offer too tempting to refuse. The key to this strategy involved patience, painstaking intelligence gathering about every facet of Seagull’s life, and a way to foster a relationship with an American counterpart he could trust. A background investigation of Seagull revealed that he had been passed over for promotion several times and was overheard telling his wife that he liked living in America and would consider retiring there if that were possible. Seagull was also concerned his country’s small pension would be insufficient to provide him with a comfortable retirement. Armed with this knowledge, security analysts believed Seagull’s allegiance to his country could be compromised if he was offered the proper financial incentives. The challenge became how to get close enough to Seagull to make him a financial deal without “spooking” him. The FBI operative, Charles, was told to slowly and systematically grow a relationship with Seagull, like aging a fine wine to bring out its best flavor, to a point where the time was ripe to approach him with an offer. The agent was told if he moved too fast it was likely that Seagull would go “shields up” and avoid him completely. Instead, he was instructed to orchestrate his approach, using behavioral strategies designed to establish friendships. The first step was to get Seagull to like Charles before they exchanged a single word. The second step was to use the appropriate verbal prompts to translate that goodwill into a lasting friendship. The preparation for the critical first encounter with Seagull started many months before the actual meeting took place. Surveillance had determined that Seagull routinely left his embassy compound once a week and walked two blocks to the corner grocery store to shop. Armed with this information, Charles was instructed to station himself at various locations along Seagull’s route to the store. He was warned never to approach Seagull or threaten him in any way; instead he was to simply “be there” so Seagull could see him. As a trained intelligence officer, it was not long before Seagull took notice of the FBI agent, who, by the way, made no effort to conceal his identity. Because Charles made no move to intercept or speak with his target, Seagull did not feel threatened and became accustomed to seeing the American on his trips to the store. After several weeks of being in the same vicinity together, Seagull made eye contact with the American operative. Charles nodded his head, acknowledging Seagull’s presence, but showed no further interest in him. Two months elapsed before Charles made his next move. He followed Seagull into the grocery store he routinely visited, but kept his distance from the foreign diplomat. With each new trip to the store, Charles continued to enter the grocery as well, still maintaining space between himself and Seagull but increasing the number of times he passed the diplomat in the aisles and increasing the duration of visual contact with him. He noted that Seagull bought a can of peas on each of his shopping excursions. With this new information, Charles waited a few additional weeks and then, on one occasion, followed Seagull into the store as he usually did, but this time to introduce himself to Seagull. As the foreign diplomat reached for a can of peas, Charles reached for the can next to it, turned to Seagull, and said, “Hi, my name is Charles and I’m a Special Agent with the FBI.” Seagull smiled and said, “I thought so.” From that first innocuous meeting, Charles and Seagull developed a close friendship. Seagull eventually agreed to assist his new FBI friend by regularly providing him with classified information. A casual observer, watching the many months’ wooing of Seagull, might wonder why it took so long for the first meeting to take place. It was not by accident. In fact, the entire Seagull recruitment strategy was a carefully choreographed psychological operation designed to establish a bond of friendship between two men who would, under normal circumstances, never contemplate such a relationship. As a member of the FBI’s Behavioral Analysis Program, I was assigned, along with my colleagues, the task of orchestrating the recruitment scenario for Seagull. Our objective was to get Seagull comfortable enough with Charles, our FBI operative, so that a first meeting could take place and, hopefully, would be followed by future meetings if Charles could make a good impression on Seagull. Our task was made more difficult because Seagull was a highly trained intelligence officer who would be constantly on the alert for any person who might arouse his suspicion, and which would result in his avoidance of that individual at all costs. For Charles to have a successful face-to-face first meeting with Seagull, the foreign operative would have to be psychologically comfortable with his American counterpart. And for that to happen, Charles would have to take specific steps, which, it turned out, he successfully achieved. The steps Charles was required to follow in winning Seagull over are the same ones you must take if you want to develop either short- or long-term friendships. Using the Seagull case as a backdrop, let’s examine the steps Charles successfully completed to recruit his target using the Friendship Formula. Proximity is the distance between you and another individual and your exposure to that individual over time. In the Seagull case, Charles didn’t simply walk up to Seagull and introduce himself. Such behavior would have resulted in Seagull’s rapid departure from the scene. The conditions of the case required a more measured approach, one that allowed Seagull time to “get used” to Charles and not view him as a threat. To achieve this end, the friendship factor of proximity was employed. Proximity serves as an essential element in all personal relationships. Just being in the same vicinity as your recruitment target is critical to the development of a personal relationship. Proximity predisposes your recruitment target to like you and promotes mutual attraction. People who share physical space are more likely to become attracted to one another, even when no words are exchanged. The key to the power of proximity is that it must take place in a nonthreatening environment. If a person feels threatened by someone being too close, they go “shields up” and take evasive action to move away from that person. In the Seagull scenario, Charles was proximal to his target, but he kept a safe distance to prevent him from perceiving Charles as a potential danger and consequently triggering a “fight or flight” response. Frequency is the number of contacts you have with another individual over time and Duration is the length of time you spend with another individual over time. As time passed, Charles employed the second and third friendship factors: Frequency and Duration. He did this by positioning himself on Seagull’s shopping route in a manner that increased the number of instances (frequency) where the foreign diplomat saw him. After several months, he added duration to the mix by spending longer periods of time around Seagull. He did this by following his target into the grocery store, thereby extending the contact time between them. Intensity is how strongly you are able to satisfy another person’s psychological and/or physical needs through the use of verbal and nonverbal behaviors. The final factor in the Friendship Formula, Intensity, was achieved gradually over time as Seagull became more and more aware of Charles’s presence and the FBI agent’s seemingly unexplainable reluctance to approach him. This introduced one type of intensity, curiosity, into the mix. When a new stimulus is introduced into a person’s environment (in this case a stranger enters Seagull’s world), the brain is hardwired to determine if that new stimulus pre­sents a threat or a perceived threat. If the new stimulus is judged to be a threat, the person will attempt to eliminate or neutralize it by employing the fight or flight response. If, on the other hand, the new stimulus is not perceived as a threat, then it becomes the object of curiosity. The person wants to learn more about the new stimulus: What is it? Why is it there? Can I use it to my benefit? Charles’s activities were conducted at a safe distance and, over time, became the object of Seagull’s curiosity. This curiosity motivated Seagull to discover who Charles was and what he wanted. Seagull later told Charles that he knew he was an FBI agent the first time he saw him. Whether this was true or not, Seagull received the nonverbal “friend” signals the FBI agent was sending him. Once Seagull determined that Charles was an FBI agent, his curiosity increased. He certainly knew he was a target of recruitment, but for what purpose and at what price? Since Seagull was already unhappy with his career advancement and looming retirement, he no doubt thought about different scenarios involving Charles, including working as a spy for the FBI. The decision to become a spy is not made overnight. Potential spies need time to develop their own rationalization strategies and time to grow accustomed to switching their allegiance. The recruitment strategy for Seagull included a length of time for the seed of betrayal to germinate. Seagull’s imagination provided the necessary nutrients for the idea to mature and bloom. This latency period also provided time for Seagull to convince his wife to join him. As Charles moved physically closer to Seagull, the diplomat did not see the FBI agent as a pending threat but rather as a symbol of hope—hope for a better life in the years to come. Duration has a unique quality in that the more time you spend with a person, the more influence they have over your thoughts and actions. Mentors who spend a lot of time with their mentees exercise a positive influence over them. People who have less than honorable intentions can negatively influence the people they spend time with. The best example of the power of duration is between parents and their children. The more time parents spend with their children, the more likely the parents will be able to influence them. If parental duration is lacking, the children tend to spend more time with their friends, including, in extreme cases, gang members. These people now have a greater influence on children because they spend most of their time with them. Duration shares an inverse relationship with frequency. If you see a friend frequently, then the duration of the encounter will be shorter. Conversely, if you don’t see your friend very often, the duration of your visit will typically increase significantly. For example, if you see a friend every day, the duration of your visits can be low because you can keep up with what’s going on as events unfold. If, however, you only see your friend twice a year, the duration of your visits will be greater. Think back to a time when you had dinner in a restaurant with a friend you hadn’t seen for a long period of time. You probably spent several hours catching up on each other’s lives. The duration of the same dinner would be considerably shorter if you saw the person on a regular basis. Conversely, in romantic relationships the frequency and duration are very high because couples, especially newly minted ones, want to spend as much time with each other as possible. The intensity of the relationship will also be very high. Think back to the beginning of your current relationship or a relationship you had in the past; you should now be able to see that it developed in accordance with the elements of the Friendship Formula. The Formula can also be used to identify the parts of a relationship that need improvement. For example, a couple who has been married for several years senses that their relationship is deteriorating, but they don’t know how to fix it. Their relationship can be self-evaluated by looking at the interaction of each of the elements of the Friendship Formula. The first element to look at is proximity. Does the couple share the same space or are they separately pursuing their own goals and rarely sharing physical space together? The second element is frequency. Do they frequently share time together? The third element is duration. How much time do they spend together when they do see each other? The fourth element is intensity, the glue that holds relationships together. The couple may have proximity, frequency, and duration, but lack intensity. An example of this combination is a couple who spends a lot of time at home watching television together, but do not interact with any emotion. This relationship can be improved if the couple increases the intensity of their relationship. They could go out on “date nights” to rekindle the feelings they felt for each other when they first met. They could shut the television off for a few hours each night and talk to each other, thus intensifying their relationship. The combinations of the four elements of the Friendship Formula are seemingly endless, depending on how couples interact with each another. In many instances, one member in the relationship travels on business most of the year. The lack of proximity can adversely affect the relationship because it often leads to reduced frequency, duration, and intensity. The lack of proximity can be overcome with technology. Frequency, duration, and intensity can be maintained with the help of email, chatting, texting, Skyping, and social media. Once you know the basic elements of all relationships, you will be able to evaluate existing ones and nurture new ones by consciously regulating the four relationship elements. To practice relationship self-evaluations, examine the relationships you are in right now and see how the four basic elements are playing a role in affecting them. If you want to strengthen a relationship, think of ways to regulate the Friendship Formula to achieve the desired outcome. You can also extricate yourself from unwanted relationships by slowly decreasing each of the basic elements of the Friendship Formula. This gradual decrease will let the unwanted person down incrementally without hurting their feelings and without seeming like an abrupt break in the relationship. In most cases, the unwanted person will naturally come to the conclusion that the relationship is no longer viable and seek more rewarding interactions. Imagine you are a scientist, with a top-secret clearance, working as a contractor for the Department of Defense. One day, seemingly out of nowhere, you receive a telephone call from a government official from the Chinese embassy. He invites you to come to China to give a lecture on some of your unclassified research. All your expenses will be paid by the Chinese government. You report this invitation to your security officer, who tells you that you can give a lecture in China as long as you don’t discuss classified information. You call to confirm your attendance and the Chinese official invites you to come a week earlier so you can do some sightseeing. You agree. You are very excited because this is a once-in-a-lifetime opportunity. You are met at the airport by a representative from the Chinese government, who informs you that he will be your guide and translator for your entire trip. Each morning the translator meets you at your hotel and has breakfast with you. You spend all day sightseeing. The translator buys all your meals and arranges some evening social activities. The translator is friendly and shares information about his family and social activities. You reciprocate by sharing information about your family, nothing important, just the names of your wife and children, their birthdays, your wedding anniversary, and the holidays you and your family celebrate. As the days go by, you are amazed that you and your translator have so much in common despite stark cultural differences. The day of the lecture arrives. The lecture hall is filled to capacity. Your lecture is well received. At the end of the lecture, one of the participants approaches you and says he is very interested in your research. He comments that your research is fascinating and innovative. He poses a question relating to the work he has been doing that relates to your research. The answer requires you to reveal sensitive but not classified information. You gladly provide the information along with a lengthy explanation even though it borders on the classified realm. While you are waiting to board your plane back to the United States, your translator informs you that your lecture was a tremendous success and the Chinese government would like to invite you back next year to present another lecture. Since the small lecture hall was filled to capacity, you will be speaking in the Grand Ballroom next year. (The Chinese translator presented an opportunity for the scientist to flatter himself, which is the most powerful form of flattery. This technique of flattery will be discussed later.) Oh, and by the way, your wife is invited to accompany you, all expenses paid. As an FBI counterintelligence officer, I was required to debrief scientists who went overseas to determine if they were approached by foreign intelligence officers seeking classified information. I interviewed many scientists who described similar stories to the one above. All the scientists reported that the Chinese were impeccable hosts and never asked about any classified information. No foul play. Case closed. I then used the Friendship Formula to further evaluate the scientists’ visits to China. Certainly, proximity was present. Frequency was low, for the scientists only went to China once a year. If frequency is low then duration must be high in order to develop a personal relationship. Duration was high. The same translator met the scientists early every morning and spent the entire day and evening with them. Based on the topics of the translators’ discussions with the scientists, intensity was high. It finally dawned on me. The scientists were being recruited but they didn’t know it and neither did I up to that point. The scientists and, for a while, I myself, did not see the re­cruitment effort. The Chinese, knowingly or unknowingly, used the Friendship Formula, which describes the way people naturally develop friendships. Because it is a natural process, the brain does not attend to this subtle recruitment technique. From that time forward, I interviewed scientists using the Friendship Formula to determine if any recruitment attempts by foreign intelligence services took place. I specifically asked the scientist to describe the proximity, frequency, duration, and intensity with any people they met during their trips. I also briefed the scientists before they went to China to be aware of the subtle techniques the Chinese use to steal our secrets. Throughout the rest of this book, the Friendship Formula will be used as the foundation upon which friendships are built. Regardless of what type of friendship you desire (short, long, relaxed, or intense) it will always be influenced by proximity, frequency, duration, and intensity. Think of the Friendship Formula as the concrete foundation upon which a house is built. The home can take many different forms, just like friendships can, but the foundation remains basically the same. I met Phillip, the son of a close friend, at a local coffee shop. Phillip had recently graduated from a small-town college and landed his first job in Los Angeles. He was single and wanted to make new friends. He had lived his entire life in small towns but suddenly found himself in a big city, where making friends seemed like a daunting task. I advised him to routinely frequent a bar near his apartment and display friend signals as he entered to send the message he was not a threat (friend signals are introduced in the next chapter), and to sit alone at the bar, a table, or a booth. Several weeks later, Phillip telephoned me and reported that I was right. The first time he visited the bar he ordered a drink, laid out the marbles, and examined them one by one with the magnifying glass. A few minutes after the bartender served Phillip his drink, he asked him about his unusual activity. Phillip told the bartender briefly about his marble collection and noted the differences in size, color, and texture of each marble. After several visits to the bar, Phillip and the bartender became better acquainted. The bartender liked Phillip and introduced him to several people who were obviously interested in his quirky hobby. The marbles served as a conversation starter and made the transition to other topics effortless. The Friendship Formula looks like magic, but it is not. It just mirrors the way people normally form relationships. And knowing the basic elements of friendship development makes building friendships easy. In simple terms, I did not readily make myself available to Vladimir, which heightened his curiosity, causing an increase in his motivation to talk. Once Vladimir opened his personal and psychological space to me, I was able to use the rapport-building techniques discussed throughout this book to bring him to the point where he willingly provided me with information. To effectively use the Friendship Formula, you have to keep in mind what kind of relationship you are looking to establish and the time you will be required to spend with your person of interest. Obviously, the formula will not play a major role in getting someone to like you if you are only going to see them once or sporadically. To illustrate: Say you’re in Cleveland, Ohio, for a one-day conference and you meet this particularly attractive man or woman (you choose which is appropriate) and want to spend the evening with him or her. When you give the person a friend signal, it is not reciprocated; in fact, the person goes “shields up.” At this point, you’re not going to get anywhere with this individual; not tonight, anyway. But, according to the Friendship Formula, if you end up moving to Cleveland, you might still be able to win this person over using proximity, frequency, duration, and intensity to develop a relationship. When two people meet each other for the first time (assuming neither person knows anything about the other person), they are strangers. Imagine yourself walking down the street in a town where you don’t know anybody and people are moving around you as they head toward their destinations. Or think of yourself in a bar or restaurant or other public building where you are among dozens of people unfamiliar to you. In these cases, you are in the “stranger” zone of the continuum. You are a stranger to those around you, as they are strangers to you. So, what makes a stranger suddenly stand out and become a person of interest? They have been picked up by, for lack of a better name, your brain’s territory scan. Scientists have discovered that as we go about our daily lives, our senses are constantly sending messages to our brain, which, in turn, processes the information to assess, among other things, if any given individual in our range of observation can be ignored, is worthy of approach, or is someone to avoid. This process is automatic or “hardwired” into our brains and is based on the brain’s capacity to interpret specific nonverbal and verbal behaviors as either “friend,” “neutral,” or “foe” signals. The function of the “territory scan” can be described using the following analogy. A woman is walking up and down a stretch of oceanfront beach. As she moves, she holds a metal detector in front of her, sweeping it left to right, side to side. Most of her walk is uninterrupted; the metal detector has not “picked up” anything of interest lying beneath the sand. But, every so often, the machine will beep and the woman will stop and dig in the sand to discover what is buried there. What she finds might be treasure . . . an expensive watch or a valuable coin. Or it could be trash . . . a discarded can or tin foil. If she is extremely unlucky, it could be some long-forgotten land mine just waiting to be detonated. Your brain is like the metal detector, constantly evaluating your environment for signals that indicate things you should approach or avoid, or that are irrelevant and can be ignored. Behavioral scientists have spent decades discovering, cataloging, and describing the kinds of human behaviors the brain interprets as “friend” or “foe” signals. Once you know what the signals are, you will be able to use them to make friends and, as a collateral benefit, keep people away from you that you would like to avoid. One of my students reported to the class that she started picking up interesting nonverbal signals at her local bar. She frequently observed that men in exclusively committed relationships sent out different signals than those men in committed relationships who were seemingly seeking extra-relationship affairs. The student commented that she could sense strong nonverbal foe signals from some of the married men that discouraged unwanted personal attention. But other supposedly committed men were sending out strong friend signals that they were seeking something extra. The student noted that these friend signals were more subtle than the friend signals transmitted by unattached men. Have you ever wondered why one individual seems to have the “knack” when it comes to attracting others, making a good impression, and getting people to like him or her, while another person, who is equally attractive and successful in life, can’t seem to duplicate that “magnetic appeal”? It often comes down to unconsciously sending off “foe” signals. Another student presented me with (unfortunately for her) a great example of this. She mentioned that she was having trouble making friends at the Midwestern college where I teach. She said that people often remarked that she appeared cold, aloof, and unapproachable, but that once they got to know her, she had little difficulty developing close relationships with them. As we talked, I found out she grew up in a tough and dangerous neighborhood in Atlanta, where she had to learn from a young age to have a very thick skin. I told her that she didn’t need to improve her communication skills, but instead, all she had to do was change the way she presented herself to people. She hadn’t stopped showing her “urban scowl” to the world. This is not uncommon for people who grow up in rough neighborhoods or even just large cities. The urban scowl sends a clear, nonverbal signal to others that you are a foe, not a friend. It is a warning to stay away and “don’t screw with me.” Predators are less likely to target people who project this urban scowl, so it becomes a valuable survival tool in tough neighborhoods. Once she makes a concerted effort to send out more “friend” than “foe” signals she will have little trouble connecting with other students. Would you want to approach the person who is pictured wearing an urban scowl? Keep in mind that many people who exhibit this expression are totally unaware they are displaying foe signals that discourage others from interacting with them. That is why an understanding of what constitutes appropriate verbal and nonverbal friend signals is so critical. Street people are constantly seeking handouts, especially in big cities. They can be persistent. Their persistence is not random, though. They target people who are most likely to give them money, and aggressively pursue them. How do they know who is a soft touch and who is not? Easy: They look for friend and foe signals. If their targets make eye contact, the odds go up. If their targets smile, the odds go up. If their targets show pity, the odds go up. If you are constantly being targeted by beggars and panhandlers, it is most likely because you are unwittingly sending them nonverbal signals that invite personal contact. Without personal contact, the chances of receiving money are nonexistent. Beggars know this and pursue targets who are more likely to give them a return on their efforts. So, in this case, an urban scowl could come in quite handy. Once, as a teenager, I was walking in a neighborhood I was unfamiliar with, which turned out to be quite dangerous. I was very much a fish out of water. An older man who recognized that I was out of my comfort zone came to my rescue. He offered me some unsolicited but extremely helpful advice in order to get me safely out of the neighborhood: “Walk like you have somewhere to go. Swing your arms and take purposeful steps. And if anyone talks to you, talk like you’ve got something to say. If you can do that, you won’t be seen as a potential victim and [will] be less likely to be victimized.” It was good advice then, and it is good advice now. Your nonverbal (how you behave) and verbal (what you say) communications send signals to those around you. Moving with purpose has a purpose. To a potential predator, you are less likely to be seen as prey, just as a healthy, speedy, alert antelope is not likely to be the target of first choice for a lion who is chasing a herd of the beasts across the African savanna. Cullen Hightower has been credited with this very insightful observation: “Strangers are what friends are made of.” Every time you encounter another person for the first time, that individual starts out as a stranger and, at the moment of contact, occupies the exact middle position on the friend-foe continuum. If you use the nonverbal and verbal signals discussed in this book, you can turn strangers into friends. Picture yourself driving home from work when all of a sudden you notice that another car is right on your tail. Your brain, which is constantly taking in information from your five senses and scanning the data for possible danger, has detected a threat. Another automobile has done something abnormal. It has intruded into the bubble of space that separates “safe distance” from “unsafe distance” and it now poses a risk to your well-being. Here is what’s interesting: You have been “automatically” monitoring the traffic behind you, not even aware you are doing it so long as other vehicles do not penetrate your bubble of protection. It is only when a trailing vehicle violates the boundaries of normal following distance that you take notice. What is true with your driving is also true with making friends. Your brain is automatically monitoring verbal and nonverbal communication. When the inputs are assessed as normal and nonthreatening, you respond to them automatically; they don’t arouse suspicion or a sense of danger. This is the reason the techniques you’ll learn in this book work; they all fall within the human baseline. Even though you might think a person would “pick up” on what you are doing, they won’t because the brain perceives these behaviors as normal and, like the cars following at a safe distance, they don’t arouse attention. I once invited two students to the front of the room at the beginning of a lecture and had them sit face-to-face in chairs. I asked them to talk to each other for five minutes. They looked puzzled and asked what they should talk about. I told them to talk about anything they wanted to. They couldn’t come up with a single subject! They just sat there and stared at each other. I then instructed them to turn their chairs back to back, and text each other about anything. Amazingly, they had no problem conversing with each other via text for the five minutes. And therein lies a problem. In the days before cell phones and video games, kids would learn basic social skills during face-to-face interactions on the playground. They learned all about making friends and how to deal with conflict and interpersonal differences; that’s where social skills were picked up. Along the way, kids learned how to read and transmit subtle nonverbal signals, even if they were not consciously aware of it. In today’s “thumb-talking” world, nobody plays ball like generations of pre–cell phone children used to. Kids stay home and play video games and text one another. Sure, there are some organized sports and school activities, but face-to-face social interaction has been drastically reduced in our tech-savvy world. That’s bad. It’s not that “tech-raised” kids lack the capacity to pick up on social skills and signals; it’s that they don’t have enough practice to hone these skills and become effective in handling face-to-face relations. A visual demonstration that face-to-face communication is more difficult than texting. In the photo on the top of page 21, note the signals of disinterest between the two individuals who are trying to carry on a conversation. The man has his hands in his pockets and is looking away. The woman is looking down. There are no head tilts, no smiles, no positive gestures, no mirroring of each other. The photo on the bottom shows the ease and positive body language associated with young people in the midst of texting. The Like Switch is designed to bring out the best in you when it comes to making friends and enjoying successful relationships—in real life, not just in digitally enhanced life. John R. “Jack” Schafer, PhD, is a psychologist, professor, intelligence consultant, and former FBI Special Agent. Dr. Schafer spent fifteen years conducting counter-intelligence and counterterrorism investigations, and seven years as a behavioral analyst for the FBI’s National Security Division’s Behavioral Analysis Program. He developed spy recruitment techniques, interviewed terrorists, and trained agents in the art of interrogation and persuasion. 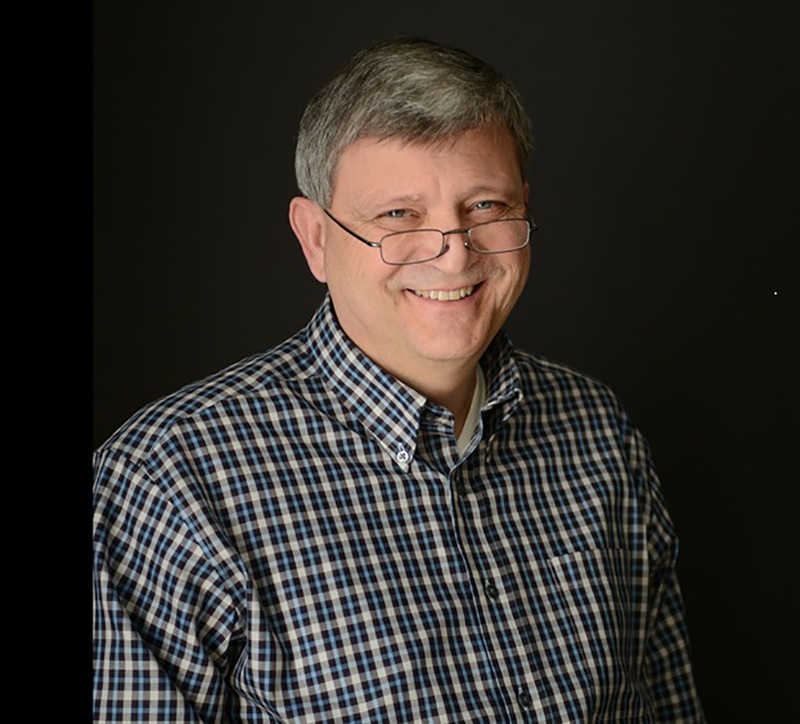 Dr. Schafer contributes online pieces for Psychology Today Magazine, has authored/coauthored six books, and has published numerous articles in professional and popular journals. He is a professor with the School of Law Enforcement and Criminal Justice at Western Illinois University. 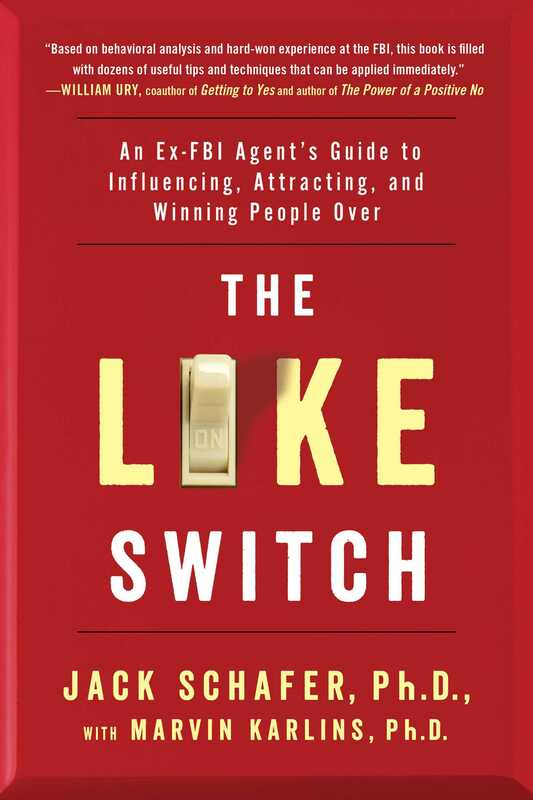 "This practical and insightful guide to influencing people, based on behavioral analysis and hard-won experience at the FBI, is filled with dozens of useful tips and techniques that can be applied immediately. I enjoyed it and learned a lot!"